Rancourt's craftsmen don't pre-punch a shoe's vamp or the uppers. They build each shoe simply by stitching the pieces together with a hearty needle. "The reason you should buy a hand-sewn shoe from Maine is because the quality of the materials we use here is exceptional and the construction is outstanding," says Kyle Rancourt, a third-generation shoemaker based in Lewiston, Maine. "We're the only one still making them in a really traditional way." His company was recently commissioned by Red Wing to produce a small collection of shoes using the traditional moccasin construction which originated in Maine. And we're seeing more and more footwear coming out of the New England state. The benefit is not only more American-made kicks, but more smartly-designed shoes that naturally conform to your foot—wicking away moisture and allowing your muscles, bones and tendons to support you as they were originally intended to do. 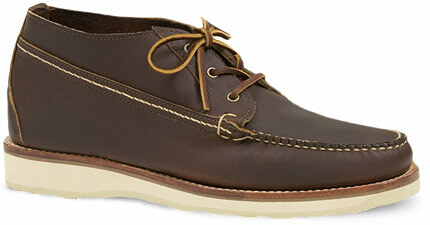 All the while offering timeless style, craftsmanship and comfort.